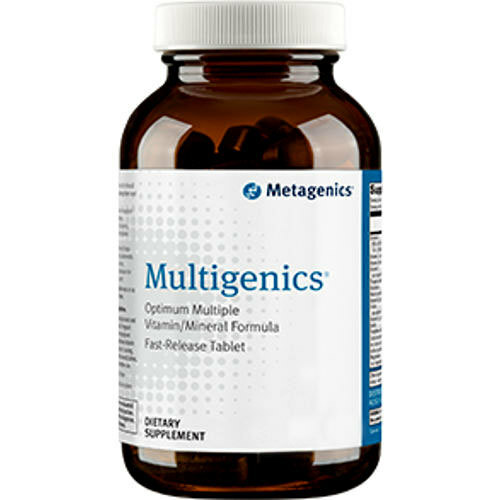 Multigenics by Metagenics is a multi-vitamin and multi-mineral formulated product. Warnings: Excess vitamin A intake may be toxic and may increase the risk of birth defects. Pregnant women and women who may become pregnant should not exceed 10,000 IU of preformed vitamin A (retinyl acetate) per day. Accidental overdose of iron-containing products is a leading cause of fatal poisoning in children under 6. Keep this product out of the reach of children. In case of accidental overdose, call a doctor or poison control center immediately. Notes: This product is gluten free. Recommended Use: Take 6 tablets daily with meals or as directed by your healthcare practitioner.